– Use bicarbonate of soda in powder form (to whiten teeth) or dissolve 1 teaspoon (5 grams) of bicarbonate of soda in a glass of water (for heartburn or bad breath). Put a little bicarbonate of soda powder on your toothbrush (the toothbrush should be wet) and brush. Repeat several times a week. After dissolving 1 teaspoon of bicarbonate of soda in a glass of water, drink quickly. Natural and cheap, useful remedy in the event of gastric acidity or heartburn; however, this preparation should not be overused for this indication, as it can cause bloating and hypertension. A risk of “rebound”, i.e. an increase in acidity over the long term, may also be associated with this preparation. 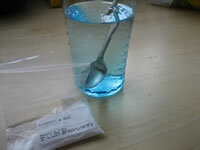 After dissolving 1 teaspoon of bicarbonate of soda in a glass of water, gargle. 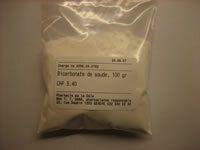 “Caution: do not use too much bicarbonate of soda, as this substance removes tooth enamel, the teeth’s only protection against external damaging effects!” By Patrice from the Creapharma forum.